Travelling across China using a combination of overnight sleeper and ultra-modern high speed bullet trains. This fast-paced journey takes us from the imperial palaces of Beijing to the skyscrapers of Hong Kong. Trip highlights include Xian's Terracotta Army, giant pandas in Chengdu and the rural town of Yangshuo. We also walk through the vast Dragon's Backbone rice terraces, stay in traditional village houses and meet the local Zhuang tribes, ending the trip in cosmopolitan Hong Kong. Arrive Beijing and check-in at hotel. The rest of the day is free to relax,or perhaps explore something of our local surroundings and acclimatise a little to the enigma that is Beijing. Our hotel in Beijing was established by the Tobacco Monopoly Bureau of Hunan Province and is close to the Temple of Heaven, Taoranting Park and the railway station hotel and is 30 minutes-walk to the Tiananmen Square. All rooms have satellite TV, a safety box and Internet Access. There are a number of restaurants, one of which is known for its Hunan cuisine and serves Chinese and Western style dinners. There is a tea garden serving Chinese and Western drinks, chess and card room and even a foot massage room. Foreign exchange and laundry are also available. Day 2 - Free in Beijing to visit Tiananmen Square. Today offers a chance to explore something of a city that has been at the centre of China, politically and culturally, since the days of the great Kublai Khan. You could pay a visit to Tiananmen Square and the Forbidden City, home to the Ming and the Manchu (Qing) emperors for over 500 years. Other options include a visit to the Temple of Heaven, a trip out to the Summer Palace, or a tour of the city's fascinating hutongs (traditional alleys and backstreets) by rickshaw. This morning we drive by private bus to Mutianyu, some 90 kilometres to the north-east of the city, to pay a visit to China's famous Great Wall. One of the country's most iconic symbols, the Great Wall stretches from the China Sea to the Gobi desert, a journey of over 5,000 kilometres. The section we visit today is one of the best preserved parts of the wall, built over 400 years ago during the Ming dynasty. Over 10 kilometres in length, this magnificent structure crosses five mountain passes and features two beacon towers and nearly 70 watchtowers. Returning to Beijing in the afternoon we make a brief stop at the Birds Nets stadium, the main venue of the 2008 Beijing Olympic Games.This evening we board an overnight sleeper train to Xian. We arrive in Xian early this morning and walk the short distance to our hotel in time for breakfast. The rest of the day is then free to make the most of China's old imperial capital. You might like to pay a visit to the Big Wild Goose Pagoda, a 64 metre high structure that offers some superb views out across the city. Another possibility is a visit to the Shaanxi National Museum. Alternatively, the network of alleys that make up the city's Muslim Quarter provide an excellent destination for a day of exploring. The hotel in Xian offers good sized rooms with en-suite facilities and internet connection, TV, air-conditioning and a tea/coffee maker. Hotel facilities include a restaurant, fitness/health centre, sauna, laundry service, safety deposit boxes and Wi-Fi. The hotel is located close to the railway station with the bus for the Terracotta Warriors leaving from across the road. 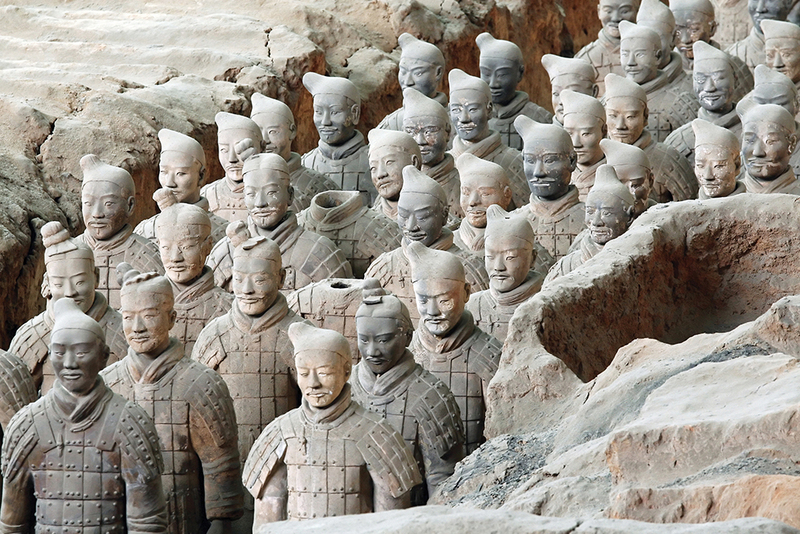 Today we visit one of China's most famous sights, the Terracotta Army of Emperor Qin Shi Huangdi. Travelling by private bus to the site on the outskirts of Xian, we spend three to four hours exploring the well preserved characters, visiting the three excavated pits that hold, literally, thousands of life-sized archers, soldiers and charioteers. Buried here to guard the tomb of China's first emperor, the Terracotta Army is considered to be one of the greatest archaeological finds of the last century. Before experiencing the site, we visit a workshop close by where we witness the making of smaller versions of the Terracotta figures which gives some idea of the challenge that the Chinese craftsmen had when making the life sizes equivalent. Returning to Xian, we then travel onto the Tang Art Museum where we try our hand at the ancient art of calligraphy which of course is Chinese letter writing - learn how to write your name in this ancient communication style. We take the Xian to Chengdu bullet train to Chengdu, the capital of China's Sichuan Province. The line is one of China's newest state of the art high speed train routes, reducing the journey time from upto 18 hours to around 4 hours. The line opened on 6th December 2017 and has a top speed of 250km/h travelling 658 kilometres in total. Travelling by high speed rail in China is a highly efficient way of covering large distances and offers views of the country you wouldn't get by taking a domestic flight, passing through the central Shaanxi plains with views of the Qinling Mountains and the western edge of the Sichuan Basin. It's also an opportunity to meet with local people along the way. It's possible to purchase food and drinks on board either from the buffet car or from the trolley service. Food on board is usually Chinese style, western food is usually not available. The city of Chengdu once marked the starting point of the old southern Silk Road and can trace its ancestry back over 2,500 years. On arrival we head to the Kuan Zhai district of Chengdu, formed of three main alleyways, the majority of the buildings dating back from the Qing Dynasty (although renovated extensively between 2005 and 2008) with ancient temples which have all been featured in numerous films as part of exterior scenes of period movies. Day 7 - Visit the Panda research centre. Bullet train to Guilin. Chengdu is home to the world famous Panda Breeding and Research Centre which lies just on the outskirts of the city. This morning we travel directly to the centre to see an animal that has become synonymous with China itself. Home to numerous free roaming Giant Pandas, the ultimate aim of the centre is to reintroduce these rare animals back into the wild in such numbers as to ensure their survival. To that end, the centre has enjoyed an extraordinary level of success with numerous new-born pandas over the past few years. After lunch we head to Chengdu east railway station and board the bullet train to Guilin using the newly opened high speed link. Guilin is China's most picturesque region and its breath-taking scenery has attracted many visitors (and famous poets and artists!) for thousands of years. 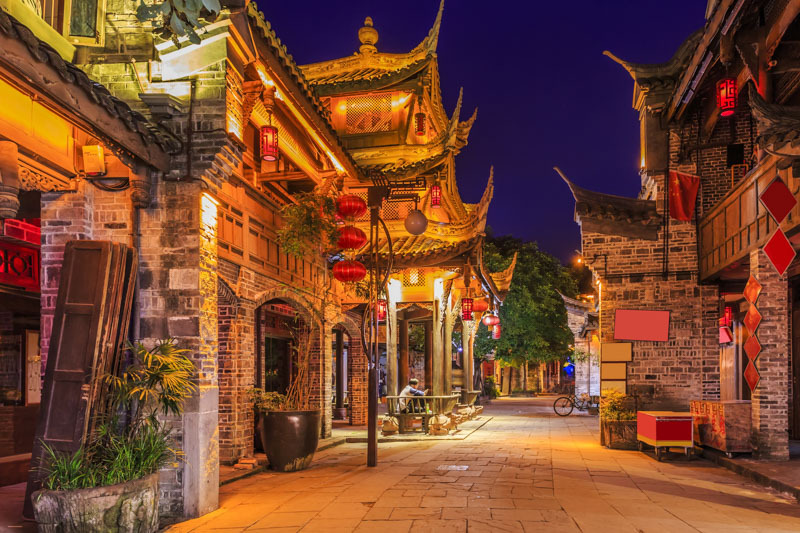 The city boasts an active nightlife but you can still catch a glimpse of Guilin's yesteryears in the countryside which continues to be home to many ethnic minority groups. The village of Pingan sits perched on the central ridge of the Dragon's Backbone, a visually stunning series of rice terraces that runs along the meandering contours of surrounding hills. Upon arriving at the village, we take a walk around and meet some of the local Zhuang people and see the unique agricultural feat of engineering that has created this remarkable landscape. Today's walk follows the rice terraces and there are a lot of steps along the route, we can take our time to enjoy the views and with plenty of breaks to rest our legs during the three hour adventure. The guesthouse in Pingan is a small family run hotel set in a wooden style building design. There are good views of the local area and over the rice terraces from the balcony. The guesthouse gives a good location to wander around the surrounding area and discover the local village. The rooms are simple but clean with air conditioning, TV and internet access in the lobby. The Zhuang migrated into this region of China over 5,000 years ago and today represent the largest of the country's minority groups. Skilled in weaving and embroidery, the Zhuang follow a fascinating tradition of beliefs that are deeply rooted in the power of nature. This morning we take a walk for around three hours to another Zhuang village at Longji following a flat path. We then drive on to the small market town of Yangshou late this afternoon. Nestling besides the banks of the Li River, Yangshou lies amongst what many consider to be some of the most scenic landscapes in China. The hotel in Yangshuo has tastefully decorated rooms with air-conditioning and heating, private bathrooms, radio, TV and phone. It is easy walking distance from the centre and close to the famous Western Street and a local food market that opens in the evening. There is a bar and lounge area, shopping arcade and Chinese and Western Restaurants. The hotel also offers laundry service, safe-deposit box and even shoe shine facility. There is a bank next door for currency exchange. We visit a cooking school in the city where the whole family learn how to prepare a number of traditional Chinese dishes using local produce for our lunch today. The afternoon is free for you to relax and soak up the atmosphere of this beautiful riverside town or you may want to hire bikes and cycle out into the surrounding countryside, climb to the top of 'Moon Hill' for some wonderful views across the open plains and out to the distant mountains or take a motorised bamboo raft trip along the Li River . A wander through the town's local market offers a chance to barter for everything from batiks and silk paintings to Chairman Mao's Little Red Book. If you decide to try bamboo rafting we recommend you are confident swimming 25 metres unaided. After a free morning in Yangshou we then drive back to Guilin to take an overnight train to Shenzen, just to the north of Hong Kong. A testament to the resurgence of China as a modern world power, Shenzen is one of the country's most successful Special Economic Zones. It is also the end of our journey across mainland China. On arrival in Shenzen this morning we need to cross the border into Hong Kong by way of the Lu Wu rail connection. This requires us carrying our own bags across the border, where our local Hong Kong guide will be waiting to take us to our hotel, travelling with the locals on the MTR metro system. The rest of the day is then free to relax and enjoy one of Asia's most vibrant cities. You are free to take in Kowloon's bustling waterfront today, perhaps taking a trip on the famous Star Ferry to enjoy one of the world's most famous cityscapes from the water. Other options include a ride on Hong Kong's funicular railway to the top of Victoria Peak, where you can enjoy some panoramic views out across the city and the outlying islands. You could also visit the Lam Tsuen Wishing Tree, one of the city's most popular shrines, or take a stroll through the stalls and markets of Li Yuen Street in search of some last minute bargains. Tour ends this morning after breakfast. China has primarily a temperate climate, with a wide spectrum of extremes due to its huge area. Summer months are hot and rainy though in the south the climate is tropical and we can experience rain at any time of the year, often falling in sharp tropical rain-storms which are heavy but short lived. Winter is colder and drier, temperatures in Beijing can be as low as -12c. Hong Kong enjoys more of a sub-tropical climate and the winter months tend to produce temperatures in the high teens, with January being more susceptible to cloud cover, with occasional rain and cold fronts. A selection of optional activities are listed below to help you budget for your Family adventure. Whilst the basic tour price you pay before you travel includes a great selection of highlights, we have also built in free time to allow you the flexibility to choose from a carefully selected range of additional excursions and activities or take time to relax, the choice is yours. At certain destinations along the way there may be several options to choose from and it may not be possible to fit all the activities in; your Explore Leader will be able to give advice on which are the most suitable for your family. Lightweight clothing is needed all year round with some warmer clothes for the cooler evenings. Casual clothes are the most practical. You may also wish to bring some lightweight rainwear or an umbrella. It is essential that your baggage is lockable; the airport authorities insist on this. Please be aware, before boarding a flight in China that the Chinese authorities will only allow glass bottles onto aircraft if they have been checked in as main luggage. Any glass bottles in the hand luggage may be confiscated. Please bring a shoulder bag large enough to carry clothing and toiletries for the nightstop in Pingan as we will not bring our main luggage with us for the night. Torch, insect repellent, sunglasses, sun cream and a water bottle. A Mandarin phrase book may also be helpful. In this region, tipping is a recognised part of life across the service industry. Local staff will look to members of the group for personal recognition of particular services provided. To assist with this your Explore Leader may organise a group tips kitty for included activities and meals, they will then account for kitty use throughout the tour. For this we suggest £25 per family member. For all non-included services and meals on your trip please tip independently at your discretion. Either EUR, USD or GBP. We'd strongly recommend changing enough money for the duration of your trip at the airport on your arrival. When changing money ask for a receipt so you can change Yuan back into your own currency when leaving China. Most major restaurants and stores. Travellers cheques can be changed in Hong Kong and at the Bank of China in all major cities but only during bank opening hours. Please note this is very time consuming and is not recommended. In all towns - your Tour Leader will advise you on arrival. When changing money ask for a receipt so you can change Yuan back into your own currency when leaving China. As tourism developed relatively recently in China, accommodation is usually modern, spacious and comfortable, albeit rather generic. Most hotels are large and purpose built and though rarely characterful, you can generally rely on good facilities. In Beijing we use a three star hotel within walking distance of Tiananmen square providing easy access to numerous main sites. In Xian we use a four star hotel opposite the main train station, here again we have chosen the hotel for its proximity to the city's main sites. Elsewhere the hotels that we use are of international style generally with business facilities, restaurants and bars and all mod cons, though few have pools. In other cities and large towns the standard is similar although on a lesser scale. In small towns or villages where tourism is less prevalent, the hotels we use are smaller and facilities are more limited, though we generally stay in the best place in town. Rooms will still be en suite but rooms can be basic. Plumbing and electricity supplies can be somewhat erratic and although the welcome is warm, service levels may be less efficient than you might expect. Please be aware that the beds in China are often quite firm and may take a few nights for you to get used to. On days where we will arrive on a sleeper train the Tour Leader will try and arrange an early check in for the group, however this may not be possible as the majority of hotels in China offer check in from 12 noon. When travelling on sleeper trains we use a combination of a 'hard sleeper' berth (usually on the Shenzhen to Guilin journey), which are berths with 6 beds (3 on each side) and a curtain to separate from the main carriage and 'soft sleeper' berths, which are berths with 4 beds (2 on each side) which would be allocated to the Explore group. Due to the nature of booking train tickets in China we cannot guarantee that the entire group will be in the same carriage and you may be sharing your berth with non-Explore passengers or both sexes. China: A visa is required by all nationalities. A single entry visa should be arranged in advance of travelling. In order to apply for your Chinese visa you will need to submit supporting documents from our local supplier confirming your itinerary and travel arrangements, which we will obtain on your behalf. So that we can provide this for you, and to ensure all local arrangements are in place, we require a copy of your passport no later than 8 weeks before you are due to start your trip. Once we have your passport copy we shall process and pass on the documents you require 6-8 weeks before your trip, please be mindful of this when applying for your visa. If you require the supporting documents earlier than this, please contact Explore so we can arrange this. Passengers wishing to extend their stay in China should be aware that current visa regulations only allow foreigners to stay in the country for up to 30 days. Please consider this when planning your trip. Nothing compulsory, but we recommend protection against malaria, infectious hepatitis, typhoid, tetanus and polio. Consult your travel clinic for latest advice on different prophylaxis available against malaria. Travellers may wish to take immunisation against Japanese Encephalitis. Please check the latest requirements with your travel clinic or doctor prior to departure. The above is not an exhaustive list. Further information regarding vaccinations and travel health advice can be found by following the NHS and NaTHNaC links at Explore Travel Health and from your local healthcare provider. Visa and vaccination requirements are subject to change and should be confirmed by you before travelling. Triple rooms: This trip allows the option for triple rooms to be included within the booking on a selected number of night stops within the holiday. If you would like this option, a discount may be applicable on the cost of the trip - please ask our Sales team for further information. Average Age: As a guide we have identified the actual average age of the children who have travelled on this trip over the last 5 years, to help you decide whether it's the right one for your family. The average age on this trip is 13 years old, this trip is suitable for children of all ages. This adventure is an epic journey across China taking a number of overnight trains and recently opened high speed bullet trains travelling over 250kph to cover the huge distances that are involved. Families who want to really discover a country and don't mind travel around will really enjoy this holiday - plus there are lots of added extras such as flying kites, making a Terracotta statue, visiting a Panda sanctary and a cooking lesson.